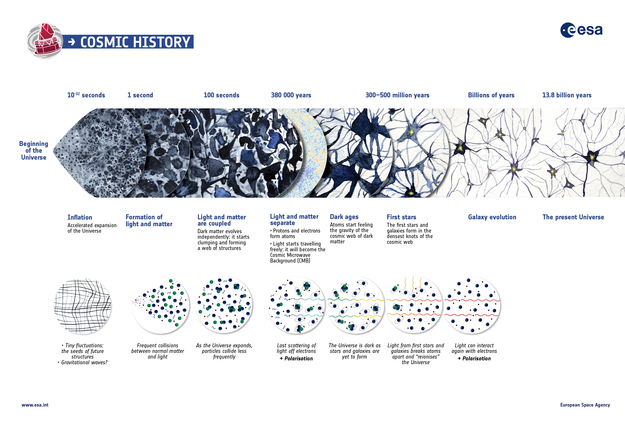 A summary of the almost 14 billion year history of the Universe, showing in particular the events that contributed to the Cosmic Microwave Background, or CMB. The timeline in the upper part of the illustration shows an artistic view of the evolution of the cosmos on large scales. The processes depicted range from inflation, the brief era of accelerated expansion that the Universe underwent when it was a tiny fraction of a second old, to the release of the CMB, the oldest light in our Universe, imprinted on the sky when the cosmos was just 380 000 years old; and from the 'Dark Ages' to the birth of the first stars and galaxies, which reionised the Universe when it was a few hundred million years old, all the way to the present time. Tiny quantum fluctuations generated during the inflationary epoch are the seeds of future structure: the stars and galaxies of today. After the end of inflation, dark matter particles started to clump around these cosmic seeds, slowly building a cosmic web of structures. Later, after the release of the CMB, normal matter started to fall into these structures, eventually giving rise to stars and galaxies. The inserts below show a zoomed-in view on some of the microscopic processes taking place during cosmic history: from the tiny fluctuations generated during inflation, to the dense soup of light and particles that filled the early Universe; from the last scattering of light off electrons, which gave rise to the CMB and its polarisation, to the reionisation of the Universe, caused by the first stars and galaxies, which induced additional polarisation on the CMB.